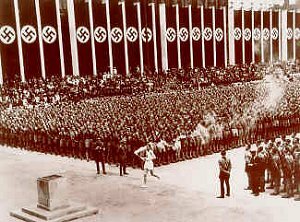 For two weeks in August 1936, Adolf Hitler's Nazi dictatorship camouflaged its racist, militaristic character while hosting the Summer Olympics. Softpedaling its antisemitic agenda and plans for territorial expansion, the regime exploited the Games to bedazzle many foreign spectators and journalists with an image of a peaceful, tolerant Germany. Having rejected a proposed boycott of the 1936 Olympics, the United States and other western democracies missed the opportunity to take a stand that--some observers at the time claimed--might have given Hitler pause and bolstered international resistance to Nazi tyranny. With the conclusion of the Games, Germany's expansionist policies and the persecution of Jews and other "enemies of the state" accelerated, culminating in World War II and the Holocaust.